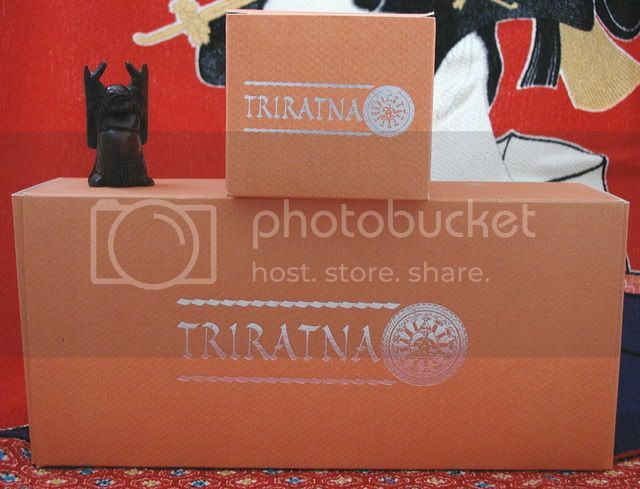 FS: Omas Triratna Sterling Silver Ltd. Ed. FP (MIB)! Saturday Greetings from DocNib's PenEmporium! The Pen Gods were smiling onme the other day when I came across a "Mint in Box" (MIB) Omas Limited Edition...the TRIRATNA Sterling Silver FP, #756/2541, complete with inner & outer box, papers, matching suede slip-case and a boxed bottle of matching ink! This big & beautiful Sterling Silver over Saffron resin FP weighs 2.7 ounces and was produced using three "Old World" techniques: Lost Wax, Haut-Bas Relief and Filigree. Cap & barrel overlays are .925 Sterling Silver, the barrel underneath is Omas's popular vegetal (cotton-based) resin in Saffron, which is the color of the Buddhist's monks robes and the Sterling Silver clip is adorned with 3-genuine Rubies. The name "Triratna" stands for "Three Gems" which is the Buddhist Trinity...Buddha, the teacher of universal compassion...Dharma, his teachings...and Sangha, the community of Buddhist followers. The cap, barrel, piston knob & nib portray the most symbolic references in the history of Buddha (in the relief) and the edition number of 2541 acknowledges the anniversary of his death in 1997, the year this pen was produced (total of 563 18K Gold versions were produced symbolizing the birth date of Buddha 2500 years ago!). 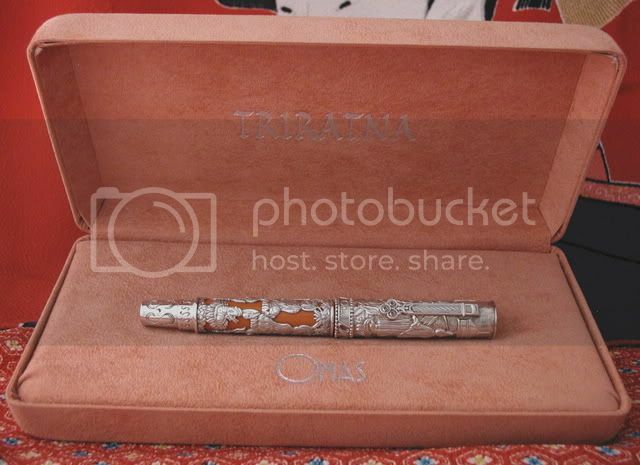 Also included with this beautiful pen is a special Saffron (Bt.Orange) colored ink in Omas's trademark design bottle & has never been opened or used. 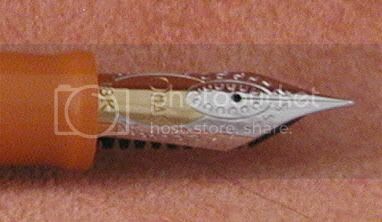 The nib is a 2-tone 18K "Fine" point and the filling system is a piston-filler (like most Omas pens) and has never been filled with ink...SWEET! This pen was purchased sometime in 1998 and stored away in a safety deposit box, only being opened up once in a while to gaze upon, so shop-wear is at a bare minimum & overall condition is "Mint"/Unused. According to the previous owner, it was only polished once with a soft cotton cloth after he got it & then left to age gracefully while resting in it's Saffron-colored suede slip case...doesn't get much better than this! Price includes U.S. shipping/International shipping will incur an extra charge (at cost). I accept PayPal Cash Transfer and PayPal Credit/Debit Card but no Personal Checks, Cashier's Checks or Money Orders on this one (unless we have a prior history). Merchandise will be shipped when funds clear. Please e-mail me at docnib@msn.com with any questions on this item! Edited by DocNib, 20 January 2008 - 03:57. Remember, reasonable offers always gladly welcome! BUMP'n back to the top! Will give this beauty an MLK Day price (today only! )...$1850.00 "Delivered" to anywhere that has mail service (but buyer will be responsible for any Customs Duty if not in the U.S.). I'll take this pen at the price of $1850.00 post paid, as per your note. Please let me know how to proceed. E-mail sent direct...Thank You Farouq! Edited by DocNib, 21 January 2008 - 22:18.